Muzzle rises from .45 hardball shot one-handed in early Army qual. Stances of the time may be why the gun got a reputation for kicking hard. Karl Rehn near Austin, Texas has become one of today’s most valuable and credible trainers in the areas of firearms and lethal force. He was, for example, the man who worked with the Texas Department of Public Safety to determine only about one out of a hundred concealed carry permit holders there went to training beyond the minimum mandatory required by the state. At Tom Givens’ Rangemaster Tactical Conference this year in Little Rock, and in a subsequent Pacific Northwest Regional TacCon in July at Firearms Academy of Seattle, Rehn presented his research on the progression of firearms training over the last three-quarters of a century. The latter program included a four-hour live fire component to supplement the four-hour lecture on the evolution of police handgun qualification. I attended both. The live-fire portion began with a pre-WWII Army qualification using the 1911 .45. All bullseye, none of it from the holster and all of it one-hand only. Distances were 25 and 50 yards. On the “long line” it was slow fire, and at 25 it was 5-shot strings in 15 seconds each, evenly split between the pace of timed fire and rapid fire in an NRA bullseye match today. We were supposed to use 1911 .45’s with 230-gr. hardball. I was lucky enough to have an up-to-date SW1911 borrowed from Marty Hayes for all that hardballin’. My bulls-eye days had been back in the ’60s and early ’70s, and the all-steel .45 was heavier and wobblier in one hand at 50 paces than I remembered! Managed to qualify, but they weren’t all in the black. Hip shooting as done circa 1950. Shooter on left is frantically reloading a revolver one round at a time! Next up was the FBI revolver course, circa 1950. No speedloaders allowed; they came into widespread police use much later. I used a DeSantis leather cartridge pouch to reload an S&W Model 15 4" Combat Masterpiece. It shot well with period-correct 158-gr. round nose lead .38 Special ammo, and gave me a 248 out of 250 score. The tough part for me wasn’t 60-yard prone or 50-yard precision shooting, it was seven-yard shooting from hip level. The technique at this distance was already obsolete when it was still in common use, and we were graphically and palpably reminded why. Karl has found with younger instructors and shooters, however, the longer-range shots often prove to be their Waterloo. Karl gave proper credit to Jeff Cooper and his iconic school, Gunsite, for popularizing two-handed eye-level shooting in police circles. We shot two Gunsite qualifiers, the one from the basic 250 course and one from the more advanced 350. To deliver a head shot in a second and a half from the leather was challenging, then and now. I shot it with Cooper’s signature gear, 1911 .45 with hardball out of a Milt Sparks Summer Special holster. Strangely enough, I scored better on the 350 than the 250. Rehn had us warmed up by that point. The ’80s and ’90s were the heyday of the traditional DA service pistol, and Karl had us shoot an FBI course from the late 20th Century. I used a Beretta 9mm. Times were much faster than in the revolver days, and of course a premium was placed on de-cocking before holstering. For a state-of-the-art contemporary qual with modern striker-fired service pistols, Rehn selected the current one from Austin, TX PD. The issue gun there is the S&W M&P, while I shot this course with a Gen5 GLOCK 19, managing to clean it. Drawing and scoring three center hits in five seconds from 15 yards can be challenging. The whole course runs 56 rounds. Karl observes qual distances have shortened over the decades, probably due in large part to analysis of the FBI’s “Officers Killed Summaries,” showing most cop-killings happen at very close range. We can’t forget to keep playing to our strengths though. In pistol fights, as the distances get longer, the rate of officers prevailing goes up significantly. Karl has noted a significant number of the current generation of instructors’ performance plunges at the longer distances required in the older courses. Many of the younger instructors could benefit from Karl’s solid grasp of the history of defensive handgun training. If our goal is to advance our art and science into the future, we need a solid grasp of how it was done in the past, and of how all that worked out. 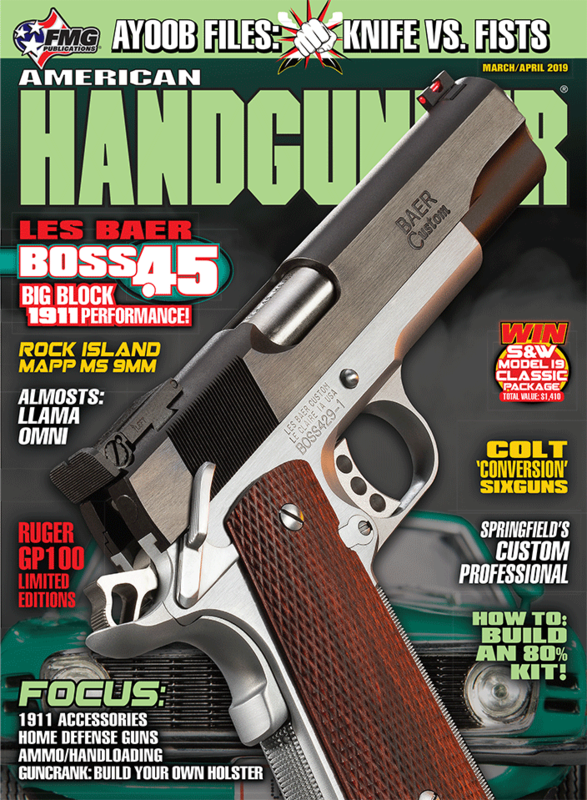 Purchase A PDF Download Of The American Handgunner March/April 2019 Issue Now!